Edel Assanti is pleased to present Stand, a site-specific work by Jodie Carey reconfigured for a four-day exhibition over the course of Frieze Art Fair at St Cyprian’s Church near Baker Street. The spectacular Victorian church provides an evocative new context for one of Carey’s most ambitious installations to be restaged. 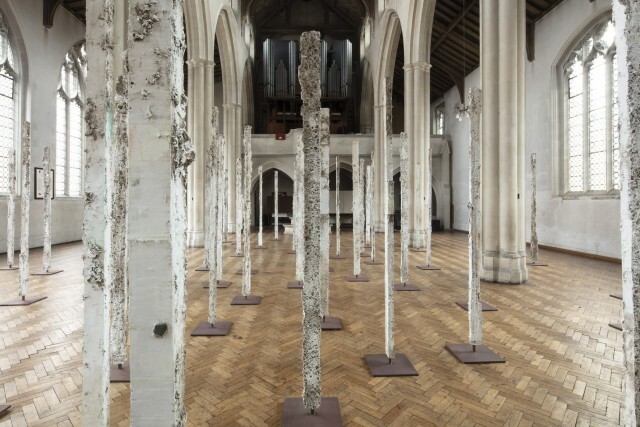 Fifty vertical earth-cast sculptures populate the church’s transept, at once industrial and abstract, whilst also organic and allusive. The monumental scale of the works belies the fragility of the plaster, soil and colouring pencil used in their making. Their tall, vertical stance recalls the timelessness of standing stone monuments or forests, evoking a primitive connection with the substance of life. Carey’s work explores fundamental methods of art-making, including carving, weaving and wall-drawing. The earthcasts are produced by casting directly in the ground: Carey buried lengths of decades-old salvaged timber in the soil, lifting them out to form rudimentary moulds. Into these imprints she pours plaster which, once solidified and excavated, bears remnants of the soil, stones and plant roots absorbed during this process. Referring to soil as the skin of the earth, Carey’s interest in soil as a material is born out of its essential relationship to life and simultaneous ability to embody death. Its complex constitution combines minerals, water, air and the decaying matter of once-living things. In this way the earthcasts continue Carey’s engagement with notions of mortality, memory and modest commemoration of everyday ritual, aligning with her previous artistic mediums of bone, ash and dust. Both before and after the casting process, Carey makes her own impression on the materials of these sculptures – beforehand, through discreet cuts and reliefs carved into the timber; afterwards, through delicate, pastel coloured pencil shading, a recurrent approach in Carey’s work, suggestive of naive mark-making and the universal human urge to make an impression on our surroundings. Special thanks to St Cyprian's Clarence Gate, Father Michael Fuller, and Robert Dowling. The closest tube station is Baker Street.